In Part 5 of this series of posts, I mentioned that St. Teresa of Avila's nestling metaphor and her silkworm/cocoon/butterfly metaphor are related metaphors of growth. This post adds three more such metaphors and writes about what each of them tells us about spiritual growth. Each image tells us something different about the spiritual journey. Some are better at telling us about ourselves, and others are better at telling us about God. The three new ones are: (1) St. John of the Cross's metaphor of the vessel filled from the spring of the Divinity; (2) St. Teresa's metaphor of the sponge soaking up the Trinity; and (3) St. Teresa's and St. John of the Cross's metaphor of the bride in the wine cellar. I recommend the ICS Publications translations of the writings of St. Teresa of Avila and St. John of the Cross, including those quoted here. I quote from older translations that are in the public domain, when I can find them, to avoid the need to ask busy friars for permission to use copyright protected materials in these lengthy posts. The growth of a baby bird learning to fly is one of the metaphors used in Interior Castle to describe the process of a soul's growth in the spiritual life. It is an image of transformation through the experience of God. The baby bird's muscles grow through its own efforts and through the body's natural growth processes as it moves its wings, tries to fly and fails, and tries again. It learns from watching more mature birds. Eventually, through no effort of its own, its feathers and wing size are sufficient to support flight, and through its patient and determined efforts, its strength and knowledge are sufficient too. The illustration of the fledgling is an excellent illustration of our own role in the growth process, but it is not a very good illustration of God's role. We can imagine the Holy Spirit's presence as the wind carries the mature bird in flight, but flight does not provide a very good illustration of God's role in growth. Other metaphors are better at that. "You have heard how wonderfully silk is made—in a way such as God alone could plan—how it all comes from an egg resembling a tiny pepper-corn. Not having seen it myself, I only know of it by hearsay, so if the facts are inaccurate the fault will not be mine. When, in the warm weather, the mulberry trees come into leaf, the little egg which was lifeless before its food was ready, begins to live. The caterpillar nourishes itself upon the mulberry leaves until, when it has grown large, people place near it small twigs upon which, of its own accord, it spins silk from its tiny mouth until it has made a narrow little cocoon in which it buries itself. Then this large and ugly worm leaves the cocoon as a lovely little white butterfly. . . .
"The silkworm symbolizes the soul which begins to live when, kindled by the Holy Spirit, it commences using the ordinary aids given by God to all, and applies the remedies left by Him in His Church, such as regular confession, religious books, and sermons; these are the cure for a soul dead in its negligence and sins and liable to fall into temptation. Then it comes to life and continues nourishing itself on this food and on devout meditation until it has attained full vigour, which is the essential point, for I attach no importance to the rest. When the silkworm is full-grown as I told you in the first part of this chapter, it begins to spin silk and to build the house wherein it must die. By this house, when speaking of the soul, I mean Christ." Before its metamorphosis, she explains, the silkworm must first grow to maturity. Only when it is full-grown does it begin to spin its cocoon. The transformation into a butterfly does not ordinarily happen until after the silkworm has matured. Only in the Fifth Mansion does she speak of that. "[The soul] commences using the ordinary aids given by God to all, and applies the remedies left by Him in His Church, such as regular confession, religious books, and sermons; these are the cure for a soul dead in its negligence and sins and liable to fall into temptation. Then it comes to life and continues nourishing itself on this food and on devout meditation until it has attained full vigour. . . ."
Through that nourishment, the soul grows to full strength. The silkworm's growth through nourishment illustrates the slow process of preparation for the spiritual metamorphosis. While the silkworm can nourish itself and build its cocoon, preparing for that death to self that leads to metamorphosis, it is changed into a butterfly through an initiative other than its own. We cannot come to God without an awareness of who He is and an awareness of our own sinfulness in His presence, and thus penance and sacrifice. That is much of what St. Teresa meant by self-knowledge. Butterfly imagery naturally makes people want to be a butterfly and not a silkworm, and thus gives meaning to the suffering and dryness of the cocoon. The object of the imagery is to reassure us that in the process of death to self is a pathway of drawing closer to God that will end in a personal transformation that is pleasing to Him. At the end of Chapter 2 of Père Marie-Eugene de l'Enfant Jesus' classic book on Interior Castle, I Want to See God , he wrote, "From the ocean of the divinity, says Saint John of the Cross, each one draws out with the vase that he brings to it. It is the degree of unitive charity that determines the capacity of that vase, and hence the power for vision and the measure of beatific joy." "In a like manner, too, does He treat many weak and tender souls, granting them favours and sweetness in sensible converse with Himself, as has been said above; this is not because He desires or is pleased that they should commune with Him after that manner or by these methods; it is that He gives to each one, as we have said, after the manner best suited to him. For God is like a spring, whence everyone draws water according to the vessel which he carries. Sometimes a soul is allowed to draw it by these extraordinary channels; but it follows not from this that it is lawful to draw water by them, but only that God Himself can permit this, when, how and to whom He wills, and for what reason He wills, without the party concerned having any right in the matter. And thus, as we say, He sometimes deigns to satisfy the desire and the prayer of certain souls, whom, since they are good and sincere, He wills not to fail to succour, lest He should make them sad, but it is not because He is pleased with their methods that He wills it." St. John of the Cross sees the soul as a vessel drawing water from the spring of the Divinity. We might think of II Cor. 4:7, in which St. Paul says, "But we hold this treasure in earthen vessels, that the surpassing power may be of God and not from us." The illustration of a spring, or of the ocean, tells us much about God's infinite presence. God is unlimited. It tells us much about the soul's ability to be filled with God in contemplation, the only limit being the limit of our own capacity. When I first noticed P. Marie-Eugene's use of the metaphor of the vase in the ocean of the Divinity, at such an early point in his book as Chapter 2, I wondered why he used that metaphor from St. John of the Cross instead of one of St. Teresa's metaphors for growth. There is no clear answer to that question, since P. Marie-Eugene does not tell us why he did so. St. Teresa's metaphors for growth, such as the fledgling and the silkworm, seem to me to be better descriptions of the process of the soul's journey toward the higher stages of prayer. After giving several months of thought to the matter, I think that P. Marie-Eugene might have chosen that metaphor for its better description of the soul's potential for drawing from God's infinite depths, but I am somewhat guessing at that point. Our capacity for God can grow as we grow in love for God. The image is a bit limited in that a vase or vessel cannot grow. In that respect the illustration does not tell us much about the soul's ability to increase its capacity. We know from St. John of the Cross's context that the soul can grow stronger. However, his illustration is excellent in telling us about God's role in our growth. The "spring" of the Divinity provides a better illustration of the infinite Deity we access in prayer, through the limited vessels of our individual souls. This metaphor also illustrates how God deals with each soul individually, according to its capacity. God sometimes gives extraordinary experiences to people who are weak and whose request for such experiences does not please God. In asking for such things, he says, "although such a person may be assuming the faith, and believing it, nevertheless he is showing a curiosity which belongs to faithlessness." (Ascent Book II, Ch. XXII). St. John says, "For it is tempting God to seek to commune with Him by extraordinary ways, such as those that are supernatural." (Ascent Book II, Ch. XXI). But God sometimes grants such experiences to the weak because "He wills not to fail to succour, lest He should make them sad." "And so we must now be guided in all things by the law of Christ made man, and by that of His Church, and of His ministers, in a human and a visible manner, and by these means we must remedy our spiritual weaknesses and ignorances, since in these means we shall find abundant medicine for them all." St. John of the Cross's counsel, in the ascent toward union with God, is the same as the means of growth that St. Teresa describes in Interior Castle: It is through the ordinary methods like the Sacraments, Church teaching, the homilies of good priests, meditation, and prayer. "Wherefore, in all our needs, trials and difficulties, there remains to us no better and surer means than prayer and hope that God will provide for us, by such means as He wills. This is the advice given to us in the Scriptures. . . ." (Ascent, Book II, Chapter XXI). Teresa's references to a sponge appear in Relations III, Para 9, and in Relations IX, Para 10. "I retain to this day, which is the Commemoration of St. Paul, the presence of the Three Persons of which I spoke in the beginning; they are present almost continually in my soul. I, being accustomed to the presence of Jesus Christ only, always thought that the vision of the Three Persons was in some degree a hindrance, though I know the Three Persons are but One God. To-day, while thinking of this, our Lord said to me 'that I was wrong in imagining that those things which are peculiar to the soul can be represented by those of the body; I was to understand that they were very different, and that the soul had a capacity for great fruition.' It seemed to me as if this were shown to me thus: as water penetrates and is drunk in by the sponge, so, it seemed to me, did the Divinity fill my soul, which in a certain sense had the fruition and possession of the Three Persons. And I heard Him say also: 'Labour thou not to hold Me within thyself enclosed, but enclose thou thyself within Me.' It seemed to me that I saw the Three Persons within my soul, and communicating Themselves to all creatures abundantly without ceasing to be with me." What she recounts there is somewhat similar to St. John of the Cross's vessel in the spring in that she imagines God as being like water. She sees her soul as being like a sponge instead of a vessel. She describes that sponge as the way in which she saw the Three Persons of the Trinity filling her soul. Yet, God then told her not to just see Him as within herself, but rather to see herself as within God. In that way, the sponge, in God and filled with God, is like the vessel in the spring and filled with water from the spring. St. Teresa is not speaking of the sponge as varying from soul to soul because she is speaking specifically of herself. That was St. John of the Cross's insight. St. Teresa's insight is that the sponge of one's soul is filled with all three persons of the Trinity, and not only with Christ. That point can be shown in Scripture, and it is not unique or new to St. Teresa. God is love (I John 4:8), and there is love among the persons of the Trinity. The entire Trinity within us enables an encounter with God's love, as described in Eph. 3:17-19, II Cor. 4:6-7, Phil. 4:7-9, Gal. 5:22. The growth in that encounter is fundamental to our growth in the love that P. Marie-Eugene says determines the capacity of our vessel. "On one occasion, I understood how our Lord was in all things, and how He was in the soul; and the illustration of a sponge filled with water was suggested to me." Again, the sponge illustrates both how God is in all things (We are in God), and in the soul (God is in us). In visualizing herself within the infinite Divinity, she shows us how small, finite, and ordinary we are. The sponge could think itself to be the center of attention, filled with so essential an element as water, if it could not see itself as little and immersed into a limitless flow of living water from the source. Here, we might think of today's reading from Mass, in which St. Paul says, "I will rather boast most gladly of my weaknesses, in order that the power of Christ may dwell with me." (II Cor. 12:9). St. Teresa's reference to growth here is her statement that the Lord told her not to "labour" to hold Him within herself, but rather to "enclose" herself within the Lord. This involves meditation and growth in self-knowledge. I include these texts because they add to St. John of the Cross's vessel illustration. Both speak of God filling us. It is not hard to go from what St. Teresa wrote to concluding that our capacity for being filled with God "in whom we live and move and have our being" (Acts 17:28) depends upon our soul's capacity to absorb the Trinity. Meditation with an awareness of one's own littleness, enclosed in God's infinity, is essential to preparing ourselves for unity with God in contemplation. St. Teresa of Avila, in her Meditations on the Song of Songs, Chapter 6, wrote from Song of Songs 2:4, "The King brought me into the wine cellar and set charity in order within me." Seeing the Lord as King, and the soul as the King's bride, she wrote that a person can be given a larger or smaller amount of wine to drink, "a good or a better wine", which will make him more or less intoxicated. She compares that to God's gifts which vary from one person to another. While God gives differing amounts to different people, St. Teresa observes, from the fact that the King brings the bride into the wine cellar, "It doesn't seem the King wants to keep anything from her." God's will is to give Himself fully to each soul. Yet, if she were to drink it all, she might lose her life from drinking in more than her natural weakness can stand. "Let it die," she says, "in this paradise of delights." The message of growth here is much the same as that of the silkworm that must endure a death in its cocoon to become a butterfly. She is speaking of the death to the world that must come if we are to experience the fullness of all that God wishes to give us. While different people receive different amounts from the wine cellar, it is God's will to give each soul everything He has to offer. Some hold back from the fear of that death to self. The process of growth in the first four Mansions of Interior Castle is that process of growth that prepares a soul to receive all that God wishes to offer, even at the cost of dying to the world and living for God. "If, then, the soul conquer the devil upon the first step, it will pass to the second; and if upon the second likewise, it will pass to the third; and so onward, through all seven mansions which are the seven steps of love, until the Spouse shall bring it to the cellar of wine of His perfect charity." In Ascent, the bride in the wine cellar represents the perfection of unitive love in the seventh mansion -- God's "perfect charity" or "unitive charity" in spiritual marriage. And while such unitive charity is limited to the higher mansions, St. John of the Cross speaks of "seven steps of love" in all seven mansions, as the soul moves toward that perfect charity of the wine cellar. First Mansion: St. Teresa mentions mutual love among nuns, watching for Satan's divisive efforts. The soul entering the castle turns toward the center, where the King is, with an awareness of to whom one is speaking. Second Mansion: The soul can hear the Lord when He calls. From time to time, he draws us near through words spoken by others in homilies, books, illnesses, trials, and truth taught during brief moments spent in prayer. God waits for us patiently. Third Mansion: The soul's love has not yet reached the point where love overwhelms reason. But reason makes the soul dissatisfied with going step by step in serving God. The soul begins to want a supernatural means of reaching the center where the King is. Fourth Mansion: Supernatural experiences begin, with the prayer of infused recollection and quiet, or spiritual delight. This is a stage of transition when both consolations and spiritual delights are felt. St. Teresa defines love as desiring to please God. This is the introduction to the unitive love between God and the soul leading toward spiritual marriage. St. Teresa then takes us into her description of the Fifth Dwelling Place, which she says most people who pray enter at some level. Indeed, she says, all who wear the Carmelite habit are called to prayer and contemplation. But there are various levels of the Fifth Dwelling Place, and some of them are experienced by only a few. She cautions, "But, daughters, if you would purchase this treasure of which we are speaking, God would have you keep back nothing from Him, little or great." "There is no more certain sign," she says, of "whether or not we have reached the prayer of union." Those who are there have "died entirely to this world, to live more truly than ever in God." This is the spiritual death of the cocoon, which only those who have already grown enough spiritually are likely to endure. This is Part 5 of a series of posts on St. Teresa of Avila's dove metaphor. The entire series can be found in the Dove Category of this blog. The video shown here in a preview for the new Disney movie "Earth", showing a baby bird -- a fledgling -- bravely, briefly airborne, its body scarcely slowing its fall to the leaves on the ground below. The bird jumps up from the pile of leaves, ready to try again, as only a youngster can. It is an illustration for Parts 4 and 5 of this series: the young dove seeking the things of God, not yet mature enough for the flight of contemplation. In Part 4, The Courage to Fly, I wrote about the "great confidence" that St. Teresa encouraged even in early stages of prayer, when she said in The Life, Chapter xiii, that "His Majesty seeks and loves courageous souls." By way of explanation, I wrote, "It is the courage that is required to let go of the ground, to let go of one's nest -- whether that nest may be possessions, ambitions, or pre-conceived notions of one's own place in the world -- and the courage to abandon oneself fully to the will of God. It is a courage that must be tempered with reason: an acceptance of God's will as seen in accordance with Church teaching and Scripture." That is what the baby bird reflects in the video: It cannot yet fly, but it has the courage to let go of its nest, and it is learning. That middle stage of growth appears in the Third and Fourth Mansions of Interior Castle, and she reflects back on it with a different metaphor of flight in Chapter 2 of the Fifth Mansion: the metaphor of the silkworm and the butterfly. I will get to the butterfly later, as it illustrates the stage of prayer that follows a remarkable personal transformation illustrated by a silkworm's transformation in a cocoon. St. Teresa's flight metaphors have to be read together, so that the butterfly metaphor and the dove metaphor must be interpreted together. But it is important not to get ahead of myself. Interior Castle is about the process of growing in prayer and in the spiritual life. Rather than talk about the butterfly, it is important to first talk about the silkworm that must precede it. The silkworm, like the fledgling, illustrates a state of growth in the life of prayer. So this post is about the growth before the metamorphosis, as illustrated by the fledgling and the silkworm. St. Teresa probably had a personal familiarity with doves (medieval manors often had dovecots as mentioned in Part 1) and with silkworms. Both images were probably familiar to her from her youth. Her father was a textile merchant who would have been familiar with the silk trade. She probably would have learned about silkworms and silk moths when she was growing up, but she had not actually seen them. The silk moth is a large white moth, just as she described it as a white butterfly. She knew what color it was. But real silkworm moths live only in captivity, are not beautiful, and cannot fly. A University of Arizona page on the silkworm has illustrations. I did not go out and do a detailed study of the 16th century Spanish silk trade for this post, but I looked at a few sources. There is a Wikipedia article about the history of the silk trade, which mentions the silk trade in Europe in the 15th to 17th centuries. The center of that industry was in Lyon, France. While it spread to other countries in Europe, it never became very large elsewhere. In St John of the Cross,: His Life and Poetry, Gerald Brenan wrote that the silk trade in Spain had been in the hands of people of Jewish descent for almost a century at the time of St. Teresa and St. John of the Cross, and was thus in the hands of new Christians. St. Teresa had had one Jewish grandparent. Her father, a textile merchant descended from "new Christians", probably told her about the growth and metamorphosis of silkworms. In Chapter 2 of the Fifth Mansions, St. Teresa introduces her silkworm metaphor in speaking of a spiritual metamorphosis of dying to self. I suppose that she switches her flight metaphor from a bird to a butterfly to better illustrate death to self, as she could not have thus described the growth of a bird from a fledgling to an adult. Later in the Fifth Mansions, she returns to the dove metaphor. Before its metamorphosis, she explains, the silkworm must first grow to maturity. Only when it is full-grown does it begin to spin its cocoon. The growth of the fledgling being far more appealing an image than the growth of a caterpillar, we can readily see why she does not mention the silkworm until she is ready to talk about the butterfly. However, rather than skip steps in the process of prayer, it is important to recognize that the transformation into a butterfly does not ordinarily happen until after the silkworm has matured, nor does a bird take full flight until after the fledgling has matured. Both are illustrations of the middle process of growth that is the subject of this post. In the Fifth Mansions, St. Teresa describes some of the steps that the soul uses to mature, in preparation for the higher mansions: "[I]t commences using the ordinary aids given by God to all, and applies the remedies left by Him in His Church, such as regular confession, religious books, and sermons; these are the cure for a soul dead in its negligence and sins and liable to fall into temptation. Then it comes to life and continues nourishing itself on this food and on devout meditation until it has attained full vigour. . . ."
This description of the soul's growth is a reference to the first four mansions according to a footnote in the ICS Publications edition of Interior Castle (in Volume II of The Collected Works of St. Teresa of Avila). Previous posts looked at St. Teresa's flight references in The Life and in the first two mansions. This one looks at the Third and Fourth Mansions. In the Third Mansions, St. Teresa says, prayer includes consolations which originate from ourselves and lead us toward God. The third mansion involves recollection by an act of the will, by human effort, as discussed in Part 1 ("Recollection and Prayer: The Will and the Dovecot"). In the Fourth Mansions, prayer also includes spiritual delights that originate from God and draw us inward toward God. The Fourth Mansions include both consolations and spiritual delights. They involve the beginning of supernatural experiences known as "infused contemplation" and "the prayer of quiet", when God initiates contemplation from within the soul, stilling the intellect, absorbing the senses, and drawing the pray-er toward Him in a silence too deep for words. Early in the Third Mansion, St. Teresa writes about her fear of falling into serious sin after writing about prayer for those who could teach her. She writes that "when I think of myself my mind cannot soar to higher things but is like a bird with broken wings." Flight belongs to the experience of the supernatural, soaring to higher things of prayer. It is incompatible with worrying about the self and the things of the world. Her saying this is indicative of humility and detachment, and of the importance of humility and detachment to prayer. Humility and detachment are key topics of the Third Mansions. The importance of humility to prayer was already discussed in Part 3 (Self-Knowledge), and detachment was discussed in Part 4 (The Courage to Fly). For pray-ers in the Third Mansions, she says (Mansions III:2), "Their love is not strong enough to overcome their reason; I wish it were—that they might not be content to creep on their way to God: a pace that will never bring them to their journey’s end!" They are walking, when they cannot reach their destination without flying. Only the infused contemplation of the Fourth Mansions (when God accomplishes very quickly what their own effort will take too long to do) will make it possible for the soul to reach the advanced mansions toward which it is journeying. "Love does not consist in great sweetness of devotion, but in a fervent determination to strive to please God in all things, in avoiding, as far as possible, all that would offend Him, and in praying for the increase of the glory and honour of His Son and for the growth of the Catholic Church. These are the signs of love; do not imagine that it consists in never thinking of anything but God, and that if your thoughts wander a little all is lost." With love defined as a fervent determination to please God, she says in the same paragraph, "to make rapid progress and to reach the mansions we wish to enter, it is not so essential to think much as to love much: therefore you must practise whatever most excites you to this." In the Third Mansions, she encourages those who want union with God to "leave our reason and our fears in His hands." She says that souls who have been brought to the Third Mansions "are likely to ascend still higher" and "will be greatly benefited by practising prompt obedience." She encourages them to take a spiritual director and advises them to "select one thoroughly detached from worldly things; it is very helpful to consult a person who has learnt and can teach this." The fledgling's early learning to fly by watching mature birds in flight becomes her illustration of the benefits of spiritual direction given by a mature contemplative: "Their flight makes us try to soar, like nestlings taught by the elder birds, who, though they cannot fly far at first, little by little imitate their parents: I know the great benefit of this." As she describes the prayer of quiet in Mansions IV:3, she uses the metaphor of a spring to describe the growth that takes place in this stage, saying that its effects include "a dilation or enlargement of the soul that may be compared to water flowing from a spring into a basin which has no outlet, but is so constructed as to increase in size and proportion to the quantity poured into it. God seems to work the same effect by this prayer, besides giving many other marvellous graces, so preparing and disposing the soul to contain all He intends to give it." She describes a great growth in the virtues, a loss of servile fear, and the soul's growing assurance "that one day it will possess its Lord". But these effects will not result from experiencing infused recollection once or twice. "The soul is not yet fully established in virtue, but is like a new-born babe first feeding at its mother’s breast", she says; "if it leaves her, what can it do but die? I greatly fear that when a soul to whom God has granted this favour discontinues prayer, except under urgent necessity, it will, unless it returns to the practice at once, go from bad to worse." The growth she describes with those images of a spring and a new-born baby is also the growth of the silkworm and the fledgling that must take place before the metamorphosis that enables flight. The fledgling, or the silkworm, has to continue growing in prayer, letting God continue to enlarge the soul's capacity to receive all that He wants to give it, by repeated experiences of the divine in prayer until it is ready for the transformation that will enable flight. The last post I did on this series was on August 24. I had set it aside for a year and then wrote a few posts from June through August, when one cat's death, a new kitten's severe illness and death, and finally an adopted 8 year old cat who needed time to adjust, all prompted me to set it aside again. The earlier posts are all in a category called "The Dove". I suppose the good thing about having a blog with categories is that I can write a little bit on the topic when I have the time and the inclination, and can set it aside again for a while. I hadn't meant for this to be written that way, but that is how it is turning out. Their flight makes us try to soar, like nestlings taught by the elder birds, who, though they cannot fly far at first, little by little imitate their parents: I know the great benefit of this. However determined such persons may be not to offend our Lord, they must not expose themselves to temptation: they are still near the first mansions to which they might easily return. Even before the second mansion, she cautions against being too eager to fly to the higher level mansions, encouraging one instead to learn the humility that comes with self-knowledge, without seeking to fly too soon (First Mansion, Chapter 2). While she discourages pray-ers in the earlier mansions from trying to get ahead of themselves, there are other references to nestlings in her writings where she encourages them not to stifle their desire to fly, but instead to understand that God loves such courageous souls. Indeed, that courage, learned before the flight of contemplation, begins to develop in the earlier stages of prayer and is necessary for the soul to eventually enter the higher level mansions. It is the courage that is required to let go of the ground, to let go of one's nest -- whether that nest may be possessions, ambitions, or pre-conceived notions of one's own place in the world -- and the courage to abandon oneself fully to the will of God. It is a courage that must be tempered with reason: an acceptance of God's will as seen in accordance with Church teaching and Scripture. "Discretion is necessary throughout. We must have great confidence; because it is very necessary for us not to contract our desires, but put our trust in God; for, if we do violence to ourselves by little and little, we shall, though not at once, reach that height which many Saints by His grace have reached. If they had never resolved to desire, and had never by little and little acted upon that resolve, they never could have ascended to so high a state. "His Majesty seeks and loves courageous souls; but they must be humble in their ways, and have no confidence in themselves. I never saw one of those lag behind on the road; and never a cowardly soul, though aided by humility, make that progress in many years which the former makes in a few. I am astonished at the great things done on this road by encouraging oneself to undertake great things, though we may not have the strength for them at once; the soul takes a flight upwards and ascends high, though, like a little bird whose wings are weak, it grows weary and rests." In I Want to See God , Père Marie-Eugène de l'Enfant-Jésus wrote about this portion of The Life in his Volume I about the first three mansions, in a chapter called "Point of Departure", saying, "Great desires alone can inspire courage necessary to surmount the obstacles that beset" the way of a great soul. "They are the wind that carries the soul high and far". St. Teresa, he says, describes her own experience here. "How can a soul so imperfect as mine aspire to the plenitude of Love? What is the key of this mystery? O my only Friend, why dost Thou not reserve these infinite longings to lofty souls, to the eagles that soar in the heights? Alas! I am but a poor little unfledged bird. I am not an eagle, I have but the eagle's eyes and heart! Yet, notwithstanding my exceeding littleness, I dare to gaze upon the Divine Sun of Love, and I burn to dart upwards unto Him! I would fly, I would imitate the eagles; but all that I can do is to lift up my little wings—it is beyond my feeble power to soar. What is to become of me? Must I die of sorrow because of my helplessness? Oh, no! I will not even grieve. With daring self-abandonment there will I remain until death, my gaze fixed upon that Divine Sun. Nothing shall affright me, nor wind nor rain. And should impenetrable clouds conceal the Orb of Love, and should I seem to believe that beyond this life there is darkness only, that would be the hour of perfect joy, the hour in which to push my confidence to its uttermost bounds. I should not dare to detach my gaze, well knowing that beyond the dark clouds the sweet Sun still shines." Denying a great desire for unity with God would be false humility, according to Père Marie-Eugène. Yet balancing such desire with descretion and strength of will, he says, "is an art, one that ordinarily the beginner does not possess." And a director, in teaching that art, "will normally advise moderation". Rather than let such moderation stifle the courage of a fledgling, St. Teresa advised caution in choosing a director. That burning to dart upwards unto God develops in the early mansions, long before the fledgling bird is ready to soar. While the fledgling should not try to soar before it is ready to fly, that great desire to soar should not be stifled. St. John of the Cross has much to say in The Ascent of Mount Carmel that might be counted as part of that "discretion" and"moderation". I would like to add part of what he wrote in cautioning against seeking "visions of images and persons from the other life" or seeking to hear "extraordinary words" in visions or "without seeing the one who speaks". In our own era, when reports of Marian apparitions so abound that the Vatican has established new guidelines for reported visionaries, a discussion of great desires in prayer could benefit from his clarity about what, precisely, it is that one is encouraged to greatly desire, and what conversely one is not encouraged to desire in that quest for flight to the higher mansions. "So he that esteems such things errs greatly and exposes himself to great peril of being deceived; in any case he will have within himself a complete impediment to the attainment of spirituality . . . . And, besides all this, when the soul sees that such extraordinary things happen to it, it is often visited, insidiously and secretly by a certain complacency, so that it thinks itself to be of some importance in the eyes of God; which is contrary to humility. . . .These representations and feelings, therefore, must always be rejected; for, even though some of them be of God, He is not offended by their rejection, nor is the effect and fruit which He desires to produce in the soul by means of them any the less surely received because the soul rejects them and desires them not." In speaking of great desires, and of a fledgling's courage to fly toward the greater mansions, then, one must always be speaking of the soul's great desire for God, and not the soul's desire for visions, apparitions, or other such experiences. St. John of the Cross is clear about this, and St. Teresa of Avila does not differ from his view on this point. "The stairs of a staircase have naught to do with the top of it and the abode to which it leads, yet are means to the reaching of both; and if the climber left not behind the stairs below him until there were no more to climb, but desired to remain upon any one of them, he would never reach the top of them nor would he mount to the pleasant and peaceful room which is the goal. And just so the soul that is to attain in this life to the union of that supreme repose and blessing, by means of all these stairs of meditations, forms and ideas, must pass though them and have done with them, since they have no resemblance and bear no proportion to the goal to which they lead, which is God." "I would, then, that I could convince spiritual persons that this road to God consists not in a multiplicity of meditations nor in ways or methods of such, nor in consolations, although these things may in their own way be necessary to beginners; but that it consists only in the one thing that is needful, which is the ability to deny oneself truly . . . . For progress comes not save through the imitation of Christ, Who is the Way, the Truth and the Life, and no man comes to the Father but by Him, even as He Himself says through Saint John. and elsewhere He says: ‘I am the door; by Me if any man enter he shall be saved.' Wherefore, as it seems to me, any spirituality that would fain walk in sweetness and with ease, and flees from the imitation of Christ, is worthless." The only goal, then, of the Interior Castle, is God, and that union is achieved by uniting one's will with Him through the imitation of Christ. In Book II, Chapter 8, St. John of the Cross speaks of faith as "the proper and fitting means of union with God." Quoting Psalm 77:14, he says it is as though the Psalmist said, "The way of approach to Thee, O God, is a holy way — that is, the purity of faith." The "seven mansions", he says in Book II, Chapter 11, "are the seven steps of love, until the Spouse shall bring it [the soul] to the cellar of wine of His perfect charity." In speaking of the "great desires" of the soul toward the higher mansions, then, we must be clear about what we are encouraged to desire, and that is the union with God that comes from growing in faith and love toward God and, particularly, from the ability to deny ourselves and follow Christ. To consider the writing of St. Teresa of Avila again, from The Life, quoted early in this post, "if we do violence to ourselves by little and little, we shall, though not at once, reach that height which many Saints by His grace have reached." She, like St. John of the Cross, is talking about the courage to deny one's own will and to live in imitation of Christ, growing in faith and in love toward Him until our will and His will are in unity in that "pleasant and peaceful room" of "the union of that supreme repose and blessing" with God. I do not know whether I have put this clearly; self-knowledge is of such consequence that I would not have you careless of it, though you may be lifted to heaven in prayer, because while on earth nothing is more needful than humility. Therefore, I repeat, not only a good way, but the best of all ways, is to endeavour to enter first by the room where humility is practised, which is far better than at once rushing on to the others. This is the right road;—if we know how easy and safe it is to walk by it, why ask for wings with which to fly? Let us rather try to learn how to advance quickly. I believe we shall never learn to know ourselves except by endeavouring to know God, for, beholding His greatness we are struck by our own baseness, His purity shows our foulness, and by meditating on His humility we find how very far we are from being humble. I mentioned that I would probably write about self-knowledge in this next post in the series, although technically, self-knowledge is somewhat tangential to St. Teresa's dove metaphors. As mentioned before, her flight metaphors must be read together, including this mention of a preference for self-knowledge and humility rather than the flight of advanced contemplative prayer. There are several reasons for pausing to write about self-knowledge. First, it is important to notice that her dove and butterfly metaphors do not encourage the flight of contemplation without proper preparation. The butterfly emerges only after it has built a cocoon and has undergone a metamorphosis within it. The dove can only soar after growing, watching the flight of other birds, and learning in stages how to fly. Second, it is important to mention that the preparation she mentions, and the self-knowledge that she has in mind, are concepts of prayer that are often misunderstood. Lastly, it is important to notice that her own reason for mentioning self-knowledge in this context is that people often over-estimate the state of their own spirituality, thinking that they have advanced to a greater level than they really have. In pride, there is a tendency to want to skip the foundational levels of basic prayer, thinking that one has already advanced beyond that point. Not so, warns St. Teresa, but rather the only way to advance in prayer is by way of humility, and not by trying to skip ahead to contemplation. "Self-knowledge" is a concept that St. Teresa would have known from medieval writers who spoke of self-knowledge, as she did, as a knowledge of our own unworthiness of God's grace that we gain from getting to know God and ourselves in prayer. To speak of that as "self-knowledge" in no way undermines the importance of the knowledge that we gain about ourselves from others, and she also placed great importance on having a wise confessor, on what we learn from being in relationship with other people, and reflection on our inner lives separate and apart from what is learned in prayer. Yet, an understanding of the concept from medieval mystics whose writings she knew will shed more light than an understanding of the writings of present day psychologists whose writings she would not have known. In a post a week ago, I compiled quotations from several writers, beginning with St. Augustine and ending with St. Teresa of Avila, on Prayer, Self-Knowledge and Humility. That will set some context on the history of the mystical view of "self-knowledge" known to St. Teresa of Avila in the 16th century. One of the medieval sources known to St. Teresa who wrote a good bit about this kind of "self-knowledge" was Blessed Angela of Foligno, from the late 13th and early 14th century. Both St. Teresa of Avila and St. John of the Cross were influenced by The Book of the Blessed Angela ("Memorial"), which was available in Spanish translation in the sixteenth century. That influence is discussed by Paul Lachance, O.F.M., in his Introduction and Notes to Angela of Foligno: Complete Works (Classics of Western Spirituality Series). As discussed by Paul Lachance, Balthasar Alvarez, S.J., who was one of St. Teresa's spiritual directors, "quotes entire chapters taken from Angela's writings in his Exhortations to his novices." (n. 220 to the Introduction). Two quotations from St. Teresa's writings, he says, are known to have been influenced by Angela's writings. Those appear in one of her poems and in her writing about trials in the Sixth Dwelling Place of Interior Castle. (note 218). Neither of those two quotations concern self-knowledge. On Angela's writings about self-knowledge, Lachance says, "The theme of self-knowledge as a foundation stone for the spiritual life was quite widespread in the Middle Ages. The basic source for it was the widely read and copied Confessions of St. Augustine." (Note 8 to the Memorial). Lachance also mentions that the theme of self-knowledge is central to Angela's spirituality, treated in numerous Instructions (Note 105 to the Memorial). He also says that "Every step of the Memorial speaks about it in one form or another." (Introduction). Angela's spirituality drew from that of earlier medieval mystics. In turn, Angela's Memorial influence St. Teresa of Avila and probably St. John of the Cross (Introduction). While St. Teresa's concept of self-knowledge could have come from others, as it was common in medieval spirituality, it is likely that three of St. Teresa's primary sources for her understanding of that concept would have been Angela's Memorial; whatever St. Teresa learned of Angela's Instructions from Balthasar Alvarez; and St. Augustine's Confessions. St. Teresa mentioned in her Life that she had read the Confessions of St. Augustine. Angela's scribe wrote of 30 steps that Bl. Angela had described in her spiritual journey. Her First Step was the awareness of one's own sinfulness, with a great fear of hell. The Second is confession; the Third penance; and the Fourth a growing awareness of God's mercy and forgiveness. The fifth step is the knowledge of self, in which the soul sees only its defects and condemns itself as deserving hell. In the Fourth Supplemental Step of the Memorial, Angela wrote of a vision she had of God's power and the smallness of creation, while at Mass in Assisi, in which God told her, "Behold my humility" and she saw God's humility toward people. She added that, "because I had understood the power of God and perceived now his deep humility, my soul was filled with wonder and esteemed itself to be nothing at all -- indeed, saw in itself nothing except pride." At first she was reluctant to receive communion, until God said to her, "I who am worthy make you worthy," giving her great joy. "The soul is first of all so filled with knowledge of itself that it does not seem to it that it could be filled more fully, nor can it be aware of anything else or remember anything else. And at that moment, it suddenly comes to the awareness of the goodness of God. It sees both together in a totally undescribable way." "The purpose of prayer is nothing other than to manifest God and self. And this manifestation of God and self leads to a state of perfect and true humility. For this humility is attained when the soul sees God and self. It is in this profound state of humility, and from it, that divine grace deepens and grows in the soul. . . . I cannot conceive anything greater than the manifestation of God and self. But this discovery, that is, this manifestation of God and self, is the lot only of those legitimate sons of God who have devoted themselves to true prayer." Accordingly, to Bl. Angela, the purpose of prayer is to better know God and ourselves in a way that leads to true humility. St. Teresa, in the section of Interior Castle quoted above, essentially echoes Bl. Angela in saying that there is nothing more needed than humility while on earth, as Bl. Angela implies as much in saying that she cannot conceive anything greater than the manifestation of God and self, which leads to humility. St. Teresa also echoes Bl. Angela in saying that "we shall never learn to know ourselves except by endeavouring to know God," after Angela wrote that the manifestation of God and self is only given to people who devote themselves to true prayer. Accordingly, St. Teresa of Avila's concept of self-knowledge needs to be understood in the context of the writings of the medieval mystics, primarily Bl. Angela of Foligno. As for Angela, St. Teresa spoke of self-knowledge as primarily the awareness of God's greatness and our unworthiness in comparison with His glory, together with the joyful awareness of God's grace that is given despite our unworthiness. This self-knowledge, learned in prayer, leads to a humility that is essential to contemplation. In addition to the portion quoted above from the First Mansion of Interior Castle, St. Teresa also makes other references to self-knowledge as an important aspect of prayer. In that portion of the First Mansion, she says that it is important " enter [the Castle] first by the room where humility is practised." While thus making self-knowledge a "room" of the first mansion, she does not limit self-knowledge to only the first mansion, nor does she describe the first mansion as being made up entirely by self-knowledge. Instead, this self-knowledge is important to every stage of prayer. In the translation of Interior Castle by Kieran Kavanaugh, O.C.D. and Otilio Rodriguez, O.C.D., that phrase is translated as, "enter first into the room where self-knowledge is dealt with rather than fly off to the other rooms." It is thus one room, and not the entirety of the First Mansion. "It is encouraging to see that trials which seemed to us impossible to submit to are possible to others, and that they bear them sweetly. Their flight makes us try to soar, like nestlings taught by the elder birds, who, though they cannot fly far at first, little by little imitate their parents: I know the great benefit of this." Here, in speaking of the role of a spiritual director in furthering self-knowledge, she has in mind a spiritual director who is a "parent" as a person more accomplished in prayer. Obedience to such a person is helpful because it enables the "nestling" to learn from the adviser's example: by watching the adviser's own self-knowledge and humility before the grandeur of God and conforming to it. What is there learned is the benefit of the adviser's own prayer, in which the spiritual adviser has already gained an awareness of God's greatness, our unworthiness, and God's grace, leading to humility and the acceptance of God's will. "The object of our life must be to do what He requires of us: let us not ask that our will may be done, but His. If we have not yet attained to this, let us be humble, as I said above. Humility is the ointment for our wounds; if we have it, although perhaps He may defer His coming for a time, God, Who is our Physician, will come and heal us." "LET us now return to our little dove and see what graces God gives it in this state. This implies that the soul endeavours to advance in the service of our Lord and in self-knowledge." In the Sixth Mansion, she describes an experience before the crucifix, reflecting that she had never had anything to give God, or to give up for Him, and He consoled her by telling her that He had given her all of His suffering in the Passion so that she could offer them to the Father. St. Teresa wrote that this example "shows that we please our Lord by self-knowledge, by the constant recollection of our poverty and miseries, and by realizing that we possess nothing but what we have received from Him." The "self-knowledge" in that example is much the same as that discussed by Bl. Angela. "The first of these is a perception of the greatness of God which becomes clearer to us as we witness more of it. Secondly, we gain self-knowledge and humility from seeing how creatures so base as ourselves in comparison with the Creator of such wonders have dared to offend Him in the past or venture to gaze on Him now. The third grace is a contempt for all earthly things unless they are consecrated to the service of so great a God." Here, St. Teresa is explicit that the self-knowledge that she has in mind is the product of seeing ourselves in comparison with the greatness of God, and how we have dared to offend Him in the past. She is also explicit that we gain both self-knowledge and humility from seeing ourselves in that light. "I do not believe God will ever bestow these gifts on such a person, as before doing so He always gives thorough self-knowledge. How can that soul, while filled with such lofty aspirations, realize the truth that He has shown it great mercy in not casting it into hell?" "Once, while I was wondering why our Lord so dearly loves the virtue of humility, the thought suddenly struck me, without previous reflection, that it is because God is the supreme Truth and humility is the truth, for it is most true that we have nothing good of ourselves but only misery and nothingness: whoever ignores this, lives a life of falsehood. They that realize this fact most deeply are the most pleasing to God, the supreme Truth, for they walk in the truth. God grant, sisters, that we may have the grace never to lose this self-knowledge! Amen." Understanding that reference in the context of Bl. Angela's writings, we should see that she is not speaking of a lack of self worth per se, but rather of an awareness that all of our virtues and all of our good are given to us by God's grace. So, St. Teresa says that "our virtues are only lent to us" in The Way of Perfection. Likewise, the Fourth Supplemental Step of the Memorial of Bl. Angela says that God wanted to give her a grace to be useful to all who sought her, and she was afraid that it would make her proud; yet God told her that she was "only its guardian" and that she would have to return it to God to whom it belongs. For both, in saying that we have nothing good of ourselves does not imply that we have no virtues, but rather that all that we have that is good is loaned to us by God's grace, and that we must give account to God for it. As illustrated here, St. Teresa saw such self-knowledge, always leading to humility, as essential to advancement in prayer and in our closeness to God. She raises the subject in the First Mansion, as quoted at the beginning of this post, and raises it again and again as essential to growth in prayer. As this series continues -- returning to the metaphors of flight and, specifically, those related to her use of the dove metaphor, the concept of "self-knowledge" will come up again. A while back, I finally started writing about St. Teresa of Avila's dove symbolism, having set it aside for a year. Since then, it was set aside again for a couple of months while I wrote about the Pope's journey to the U.S., International Eucharistic Congress, and World Youth Day, and while I dealt with losing a cat, getting a new kitten, and other issues of life. I have finally found time again to write about St. Teresa of Avila and the dove references in her writing. I should mention, I think, that I am going through a difficult time right now in a lot of ways, and that has probably begun to affect the blog. I don't think it has affected this post, but perhaps it is best to mention it lest I face a dilemma of having the writing either seem pretentious (divorced from my own present life experience) or prejudiced (too much influenced by it). There is much good together with the bad, as I have a wonderful little kitten to enjoy. Summer in San Diego is often noisy and stressful because of a mass of people, both tourists and locals, who are often out of control, sometimes have children who are out of control (They go from Legoland into the restaurants with the parents seeing no reason to lower their children's volume level or adjust their behavior, and there are some restaurants that I avoid in summer); and are often loud and drunk in public (There is often no way to avoid the drunk adults, even large numbers of them at once, following sporting events and the races.). Besides the usual summer stress, I have been depressed over a number of losses coming within a short amount of time, the only one of which i have written about here has been the death of one of my cats. All of it is passing, but it is painful at the moment. Having acknowledged that it may be affecting my writing, that may be all I say about it, but I thought it best to say something rather than nothing. I would appreciate prayer. In any case, here is the new post. The others are in the category titled The Dove. As before, I have looked for translations in the public domain and available online, in order to avoid the need to seek permissions for lengthy blog posts. It does not imply a preference for those translations. 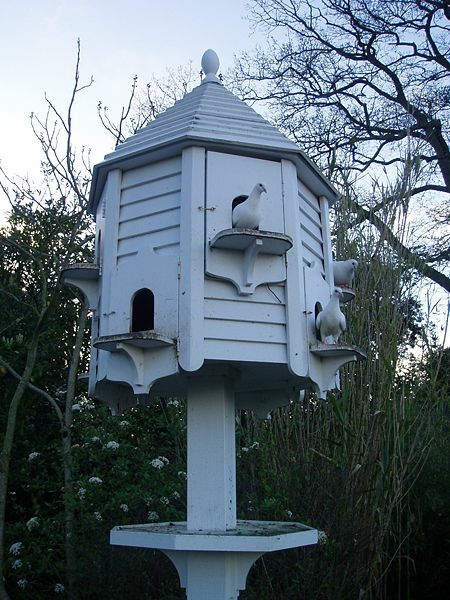 An earlier post discusses the doves and the dovecot symbolism in The Life. This post, and the next few I hope to add shortly, will discuss the dove symbolism and related flight symbolism in Interior Castle. Interior Castle is built around the metaphor of a castle of many rooms, which is a metaphor for the soul. St. Teresa used many metaphors in the course of describing the spiritual journey of a soul in the context of that "castle." One of those metaphors is a dove. It is encouraging to see that trials which seemed to us impossible to submit to are possible to others, and that they bear them sweetly. Their flight makes us try to soar, like nestlings taught by the elder birds, who, though they cannot fly far at first, little by little imitate their parents: I know the great benefit of this. However determined such persons may be not to offend our Lord, they must not expose themselves to temptation: they are still near the first mansions to which they might easily return. Their strength is not yet established on a solid foundation like that of souls exercised in sufferings, who know how little cause there is to fear the tempests of this world and care nothing for its pleasures: beginners might succumb before any severe trial. Some great persecution, such as the devil knows how to raise to injure us, might make beginners turn back; while zealously trying to withdraw others from sin they might succumb to the attacks made upon them. The metaphors of flight must be read together. She mentions "this little dove or butterfly" in the Sixth Mansion, Chapter 11, so that she makes clear herself that there is no major distinction among these metaphors of flight. To understand where St. Teresa is going with this journey, it may help to know from the outset how the journey of the dove ends. It may also help to have some of the context in which she was writing. These effects, with all the other good fruits I have mentioned of the different degrees of prayer, are given by God to the soul when it draws near Him to receive that ‘kiss of His mouth’ for which the bride asked, and I believe her petition is now granted. Here the overflowing waters are given to the wounded hart: here she delights in the tabernacles of God: here the dove sent out by Noe to see whether the flood had subsided, has plucked the olive branch, showing that she has found firm land amongst the floods and tempests of this world. The journey on which the dove sets out, as the nestling leaves its nest, is that of Noah's dove seeking firm land (God) while in the world. The journey of the dove in the Song of Songs is seeking Christ the Bridegroom as her longed-for mate. The journey of the dove in Interior Castle is likewise toward that closeness of a mystical relationship with Christ the Bridegroom that is union with Christ in this life. Other saints, writing about Genesis and the Song of Songs, have seen that dove as symbolic. St. Teresa's symbolism differs somewhat from theirs (seen elsewhere in The Dove blog category) in that her dove is on a journey, it grows from a nestling to a soaring dove, and it moves from the first mansion at the outer edge of the castle toward God's presence in the center of the castle. ALTHOUGH many of the saints who are taught by your example can scarcely emulate the greatness of your perfection, with which you shine like great luminaries with marvellous brightness in this world, yet still you, O holy brothers Honoratus and Eucherius are so stirred by the great glory of those splendid men from whom we received the first principles of monasticism, that one of you, presiding as he does over a large monastery of the brethren, is hoping that his congregation, which learns a lesson from the daily sight of your saintly life, may be instructed in the precepts of those fathers, while the other has been anxious to make his way to Egypt to be edified by the sight of these in the flesh, that he might leave this province that is frozen as it were with the cold of Gaul, and like some pure turtle dove fly to those lands on which the sun of righteousness looks and to which it approaches nearest, and which abound with the ripe fruits of virtues. As Cassian imagines a dove flying to the lands nearest to the "sun of righteousness" (Christ), so St. Teresa imagines a dove flying within the mansions of the interior castle to the innermost room in which Christ the King is found. That land, according to Cassian, abounds with "the ripe fruit of virtues." Virtues are central to St. Teresa's concept of the spiritual journey within the castle, especially the virtue of humility, which she particularly associates with the self-knowledge to be gained in prayer, as we see ourselves more clearly in the light of God's presence as the light in the innermost chamber of the interior castle. I anticipate that her concept of self-knowledge, and its importance to that journey, will be the subject of the next post in this series.